A gorgeous home in a man made island will make you want an island of your own! Whenever you hear of a home on an island, what comes to your mind at ones is the beauty of the beach and the palm trees all around it. I know you might even think of Hawaii and other tropical places. And merely thinking of it, makes us feel that it is indeed nice to live in a home like that. But since not all of us are able to do that, most of us would be happy to visit islands and resorts. It might allow us to relax only for a few days, but the experience is truly unforgettable and even magical! Nothing beats the beauty of nature! But then again, there are people who are blessed with a home in an island just like the house that we are going to feature today. 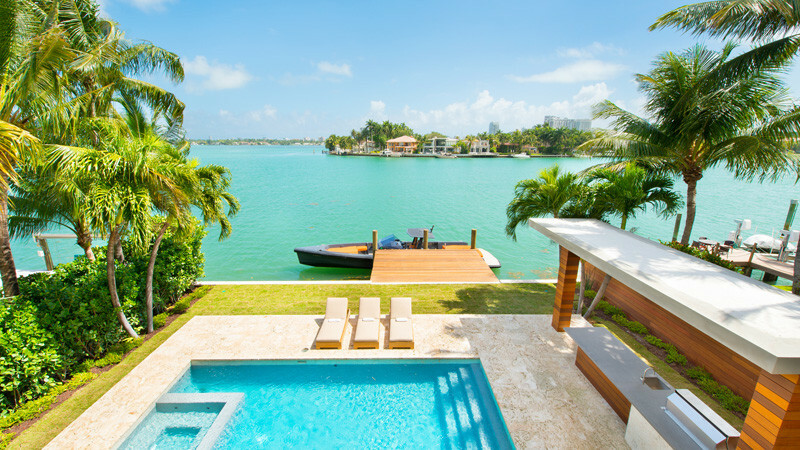 Di Lido Island is a man-made island in Miami Beach, Florida and it has amazing views of the ocean all around it plus it has lovely palm trees, bushes and plants on it as well. With that, one homeowner commissioned Architect Max Strang to design the house and to work in collaboration with builder Luis Bosch. The two design and building experts create a home that is stunning and has all the features that most of us would want for a dream home. The interior of the house has an overall relaxing feel with an open layout, creating a breezy home to live in. Let us take a look at the house below. Unique feature: A stunning exterior that used a simple material- concrete blocks. Who would think that it could change the entire home and let it stand out from the rest of the row houses? 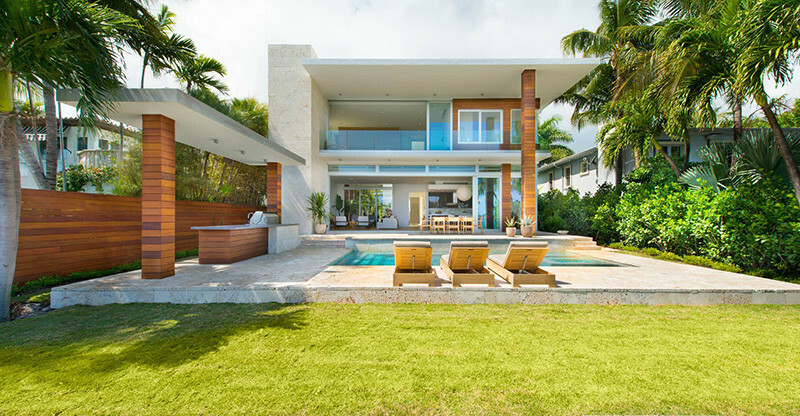 The house looks really beautiful with a pool at the front. The home has glass railings on the second level as well as floor to ceiling windows too. It also has an outdoor kitchen so that the family and the guests could have a great time outdoors. Some parts of the house has tile flooring like that you can see on the picture. If I am not mistaken, this is the garage of the house which has wooden exterior. It is a nice contrast with the rest of the building. On the front of the home is this stunning pool with lounge chairs on the deck as well as a dining area on the other side. It appears that they can fully enjoy the water both from the pool and the ocean! Another nice feature here is a private dock for your boat. It would really feel good to get off this boat and into the house! Inside the house, it has an open plan living area that opens to the outdoors, which almost doubles the size of the living space. Just look at how the outdoor and indoor areas are seamlessly connected. To add a tropical feel inside the house, some plants are brought inside and added on the corners. It is a nice way to bring nature in and extending the feel that we had from outdoors. The interior used wooden flooring as well as different kinds of furniture from a comfy white sofa to wooden chairs with soft cushions on it. The area is also defined with an area rug that has a color almost the same as the wooden flooring. The living area also has a television as well. In the open floor plan of the house, one can also see the kitchen and dining area in here. 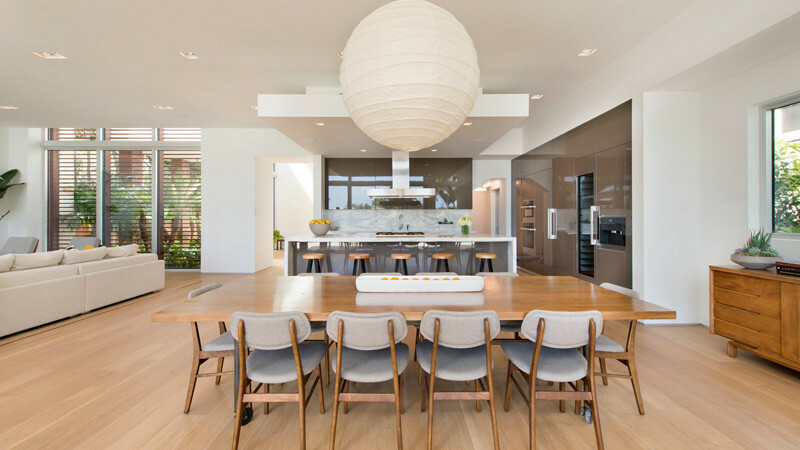 Notice that subtle Asian touch with the use of a lantern for the dining area. Wood is also used for most furniture in here. Another look at the dining area that has gray wooden chairs around a long wooden dining table. Next to it is the kitchen with a marble textured backsplash. Let us take a closer look at the kitchen area. 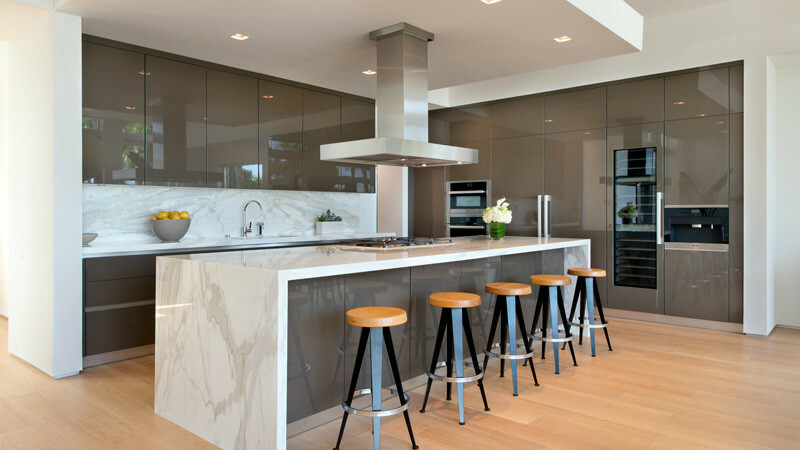 It has high-gloss cabinets and a large kitchen island that provides additional space for seating. You can see here that it has tall counter-height stools with wooden seats. Seen here is the hallway of the house that is flooded by natural light. The windows also give a brief view of the green roof outside as well as the surrounding nature. The large master bedroom has natural colors in it as well as some plants too. It has its own private balcony with glass railings which allows the homeowners to get a good view of the ocean. The bedroom does double-duty because on one side of the wall is the bed with views of the water while on the other side is a home office. It is a good idea to use space, right? This is the other side of the home office, with views of the greenery outside the window. You can also see here a tall plant and an area rug which is the same as the one used under the bed. Isn’t this a very spacious bedroom-office area? 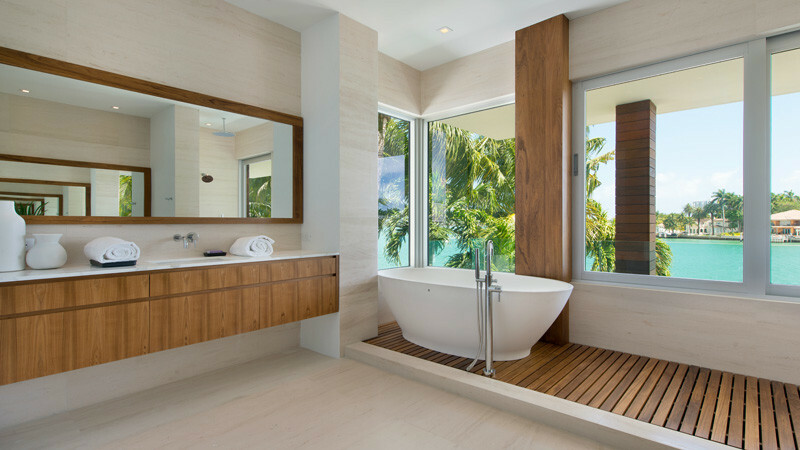 And this one is the bathroom which has been positioned to take in the views of the water. I like the mix of white and wood in here. It looks just totally nice and almost Zen-like! 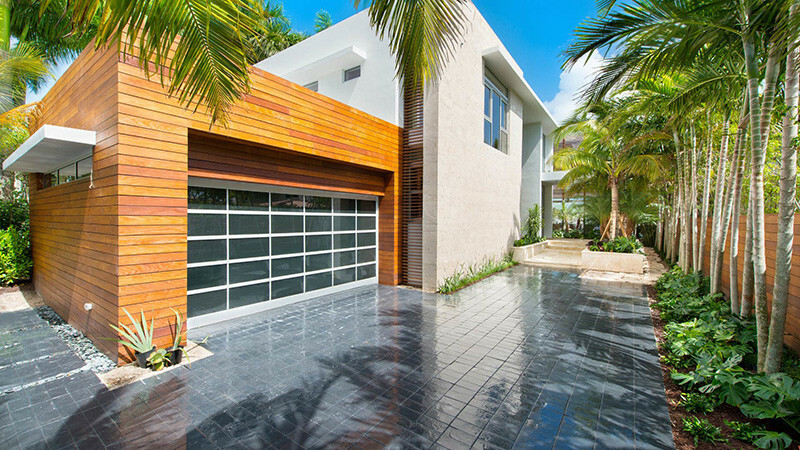 This is indeed a gorgeous home from Architect Max Strang and Builder Luis Bosch! Aside from the exterior, its interior is really nice as it used wood for the flooring and white for the walls and ceiling. The overall look of the home is very stunning and is something that we would definitely love for our own home. And the best thing about the house? Its location and the views around it. I could imagine how relaxing it would be to sit on the deck while looking at the ocean and the blue skies. Very relaxing indeed! What a nice way to unwind from a day’s busy work. I could say that those living in here are no doubt blessed!